This is not dissimilar to a chilli con carne but it tastes really fresh and summery. We loved the addition of almonds and green olives. Wine Suggestion: we echoed the summery freshness with the Flying Solo Rosé from Domaine Gayda in the Languedoc which made everything feel light and easy as we ate. If you feel like something more robust look to a good Grenache / Garnacha which we find work with the peppers and olives well. Heat the oil in a casserole and cook the beef over a high heat until well-browned. This will work better if you do it in batches, then remove to a bowl. Add the onion and chopped peppers to the pan and cook until soft and golden. Add the garlic, chillies and ground cumin, then cook for another minute before stirring in the raisins, tomatoes, tomato purée, sugar and stock/water. Cook, uncovered for 40 minutes, or until you have a thick sauce, stirring occasionally. Add the lime juice, green olives and some seasoning. Lastly stir in the coriander and sprinkle with the toasted almonds. Serve with steamed rice, avocado, sour cream & grated cheese. 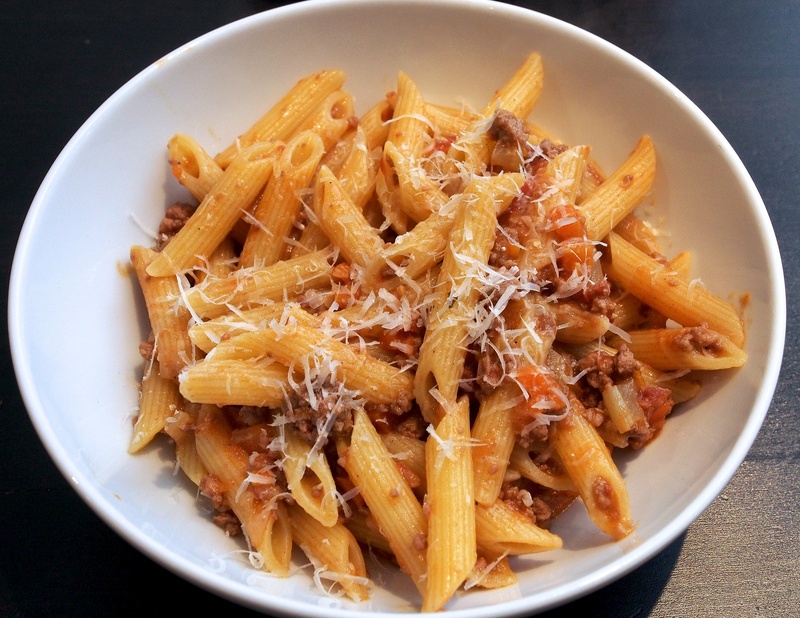 This is our go-to recipe when we want a Bolognese ragú to go with pasta like penne (as opposed to in a lasagne). We’ve done many variations over the years and even though this isn’t entirely traditional it’s ease and relative speed, alongside a great flavour, mean that we make this more often than any other. Cook the onion, carrot, celery and pancetta in the oil and butter in a heavy-based saucepan over a medium heat for about 10 minutes or until soft. Add the garlic and cook for another minute before turning up the heat and adding the mince and thyme. Brown the meat for a few minutes until it loses its raw appearance, then add the wine. Stir and reduce for a few minutes. Add the other ingredients and season well. Bring to the boil, then simmer for an hour. Cook the pasta according to the pack and toss with the hot sauce and parmesan. This is a Jamie Oliver recipe but we’ve reduced the amount of stock in our adaptation below as we thought the filling was too liquid. Easy and tasty for mid-week. We always have peas with pies. Peel and roughly chop the onions, carrots and celery. Finely chop the rosemary leaves. Heat a large casserole pan over a high heat. Add a couple of tbsp of olive oil , the vegetables, rosemary and bay leaves. Cook, stirring, for about 10 minutes or until the vegetables are soft and have started to colour. Stir in the minced beef and break up the chunks with a wooden spoon.Add the mustard, Marmite, Worcestershire sauce and 2 tsp of flour. Dissolve the stock cube in 500ml of boiling water and add to the pan. Bring to the boil. Turn the heat down and simmer with the lid askew for an hour, stirring occasionally. Fill a large baking dish with the mince filling and allow it to cool. Take the pastry out of the fridge about 10 minutes before you want to use it. Dust the work surface and your rolling pin with some flour, then roll out the pastry to the thickness of a £1 coin and big enough to cover your dish easily. Cover the dish with the pastry and run a knife around the edge of the dish to trim off any excess. Use a fork to crimp the edges and make a hole in the middle with a knife. Brush the top of the pastry with beaten egg or a little bit of milk. Bake on the bottom shelf of the oven for 40 minutes or until the pastry is golden. Wine Suggestion: an easy red wine, like a Cotes du Rhone or a Shiraz blend from Australia would work well; something juicy and with a moderate body but not too heavy at the same time. Easy drinking to match the easy eating! (Original recipe from Jamie Oliver’s Jamie’s Ministry of Food, Penguin, 2008). This comes from a cookbook (The Frankies Spuntino) that was a very thoughtful birthday present for Jules from my sister Claire: an authentic Italian hangout in New York. We’d never heard of it, so it was a great treat to be introduced to something new. The two Frankie’s have gone back to their roots to produce real home cooking like their mothers and grand-mothers made in Italy and this is a great read as well as a useful addition to our recipe inventory. A Spuntino is a snack or a place to eat them, so this is about flavour and comfort rather than cheffy complications – we like it! Warning – you will need to start this recipe the day before; it is not something you’ll have time to whip up after work as it takes at least 4 hours for the big pot of sauce alone. It is well worth it and the leftover sauce is exceptionally useful for so many extra dishes, plus it is a darn sight better than those jars of tomato sauces with celebrities on the front that you buy at the shops. Julie made the sauce while I was at work on Saturday and then we made the meatballs together on Sunday. Frankies Spuntino’s very useful tomato sauce – makes heaps! Put oil and garlic into a large deep saucepan and cook over a medium-low heat for about 10 minutes, giving the odd stir, until he garlic is deep golden with streaks of brown, and fragrant. If it starts to smell bitter or is colouring too quickly take if off the heat and turn the heat down. While the garlic is on, pour the tomatoes into a bowl (you’ll need a big one) and crush them with your hands. Discard the stem end and any basil leaves in the can. When the garlic is done, add the chilli flakes and cook them for 30 seconds or so, to infuse the spice into the oil. Throw in the tomatoes and salt and give it a good stir. Turn the heat up to medium and bring the sauce up to a gentle simmer. Leave it there for 4 hours – stirring now and again. Check for salt at the end. You can now cook the sauce with meat (as below), leave it covered in the fridge for at least 4 days or freeze for a few months. If you are cooking the meatballs cook them in the entire quantity of sauce and then keep the leftover sauce for later – it gives it a great flavour – though remember you did this when your veggie friends come over! Heat the oven to 160C/325F. Put the fresh bread in a bowl, cover with water, and let it soak for a minute or so. Pour off the water and wring out the bread, then crumble and tear it into pieces. Combine the bread with all the remaining ingredients, except the tomato sauce, in the order listed. Add the dried breadcrumbs last to adjust for wetness: the mixture should be moist wet, not sloppy wet (our mixture was sloppy wet so we added more dried breadcrumbs). Shape the meat mixture into biggish meatballs and space them evenly on a baking tray. Bake for 25 to 30 minutes. The meatballs will be firm but still juicy and gently yielding when cooked through. At this point you can cool the meatballs and leave them in the fridge for a couple of days or freeze them for later. Meanwhile, heat the tomato sauce in a saute pan large enough to take the meatballs easily. Put the meatballs into the sauce and turn the heat up a little bit. Simmer for half an hour or so until they soak up a bit of sauce. They don’t get better the longer you leave them so don’t abandon them altogether. 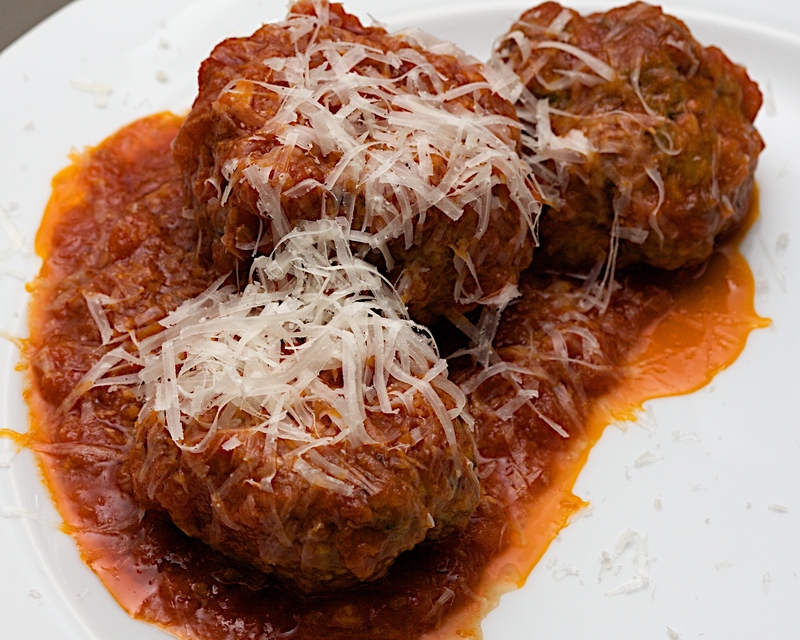 Serve 3 meatballs per person in plenty of red sauce , and cover each portion with a load of grated Pecorino. Save the leftover sauce and use it anytime tomato sauce is required eg pizza, pasta, lasagne, etc. Wine suggestion: something red and Italian is the obvious choice and will give you the right amount of acidity to balance the tomato sauce – nothing too fancy!